Business Jet Restraints options for VIP and corporate aircraft. AmSafe manufactures TSO-C114 business jet restraint solutions for forward and aft facing passenger seats, side-facing divans, attendant seats and berthing or sleeper seats. 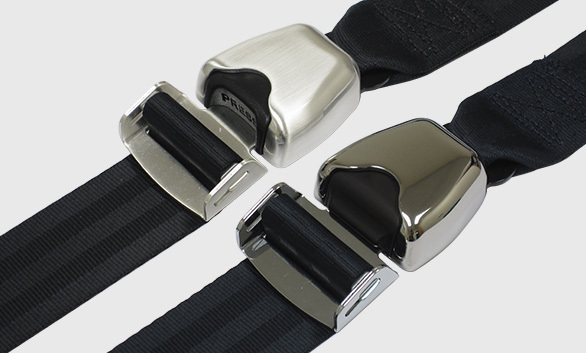 AmSafe offers several buckle choices for their business jet restraints, including tear-drop, classic square and push button, with over 150 webbing colors and multiple hardware plating possibilities. Along with its traditional restraints, AmSafe also manufactures airbag and pretensioner systems, designed to protect the head, neck, torso and legs of passengers and pilots in the event of a survivable aircraft accident. AmSafe is the traditional restraint manufacturer for OEMs such as Boeing Business Jet, Bombardier Aerospace, Cessna Citation, Dassault Falcon Jet, Gulfstream Aerospace and Hawker Beechcraft Corporation (formally Raytheon Aircraft) and our seatbelt airbag system is offered as standard equipment on most new general aviation aircraft.